Harness a lifetime of legendary optical craftsmanship, engineering, and mechanical precision with the ZEISS 1-6x24 Conquest V6 Riflescope. 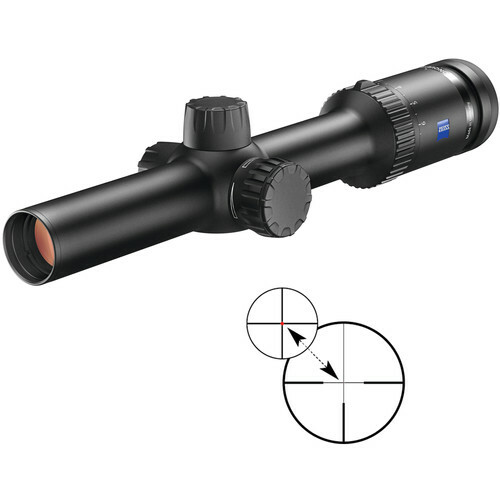 This riflescope is centered around an expertly-designed 6x SuperZoom optical system that utilizes superior components such as high-transmission ZEISS FL fluoride lenses for delivering high-contrast, high-detail, and true-color vivid images. To enhance optical performance and image brightness even further, bringing total throughput to 92%, the lenses are fully multi-coated with their proprietary ZEISS T* anti-reflection coatings. To maintain high standards of performance, even in adverse weather conditions, the exterior lens surfaces are enhanced with LotuTec hydrophobic coatings, which let droplets slide off without streaks and allow for dust and dirt to be wiped away easily. Another highlight of this scope is the Reticle 60 in the second focal plane. Inspired by the German #4 style, it has fine features and casts minimal coverage on targets. The pattern offers three thin posts, a fine crosshair, and a fine yet well-defined red (illuminated) center dot with adjustable brightness for accommodating your preferences or lighting conditions. To remove ambiguity when aiming, it also has a parallax-free zone at 100 yards. Measuring only 11.2" (28.4 cm) in length, the high-quality aluminum housing is engineered with strength, durability, precision in mind. It features a 30mm maintube and offers waterproof, fogproof, and submersible performance. Among other highlights are HT finger-adjustable graduated turrets and knurled knobs and rings. The magnification ring also features a low-profile lever for instant zoom adjustments. Box Dimensions (LxWxH) 16.0 x 4.7 x 4.4"